Xu Yuan wrote: I think DW did better in implementing Yu Jin's attitude through his appearance. Certainly better than Kessen II did. Finished on Wednesday. Fun. Here, have a Let's Play recap. It was pretty fast for an RTK game, too, which makes sense since you can spend 10 years in one city and it takes like three hours. So that's what I unwittingly did (as well as the win-10-duels-in-a-row quest, which is way easier with save states), occasionally sending someone out to conquer a city for me because I don't love the battle system in RTKX. Life was good. I was viceroy of like 13 cities, Cao Pi was under my command so I could boss him around, my sworn brother Cao Cao (it was awkward, he asked me, I didn't know if saying 'no' would cause a decrease in relationship value until Tian Yu asked me and I was like nah) became Emperor (to which there was 0 change in gameplay, interaction/dialogue, art, or gaming experience in any manner). I lost track of time a little bit just playing with the game mechanics and finding more fun and awkward situations, like when Guan Yu suddenly kept visiting my house even though I'd only interacted with him like twice 20 years earlier. Since Yu Jin historically had a totally natural Death by Emotion (and because they make him so old in the game anyway), there was no 20-year grace period for me. I had found two lifespan extension items but had also given them to Li Dian (who still wouldn't talk to me afterwards, at least at first,) and Yue Jin (also sworn brother), and couldn't find any other ones. I don't know why I didn't think about it. So I visited the observatory. Rrrgh!! Is kind of a weird thing to say when you find out you're dying. Faced with no choice but to conquer all of China as quickly as possible lest either I or Cao Cao die, I had to take the game's major shortcut. Wu Yue and Ba Shu were occupied by Sun Ce(!) and Liu Zhang, respectively - a total of something like 16 cities (equal to the number of cities that I bafflingly controlled as viceroy). China was unified a year and a half because Campaign mode is so cheap. Hooray! The Most Unlikely of Positions! Being that I was a viceroy controlling over ten cities, most on the front lines, was a class 1 officer (the last thing that happened to me in-game right after the last city was conquered was that I was promoted to class 1), had 1000 fame, and was the Oath brother of the emperor . . . wasn't this kind of a demotion? I mean, I guess I was old, maybe it was because of my officer stats/personality type. Hey, I just wish to serve my lord in whatever capacity he wants me to. A good retirement position. Plus the dynasty lasted forever and was the best in the world and the most peaceful and high tech and they built a rocket to the moon etc etc. But I went back to the saved game and tried to see if I could change it to something like being crowned King or being Prime Minister. This time, Yu Jin died. He didn't have an heir (why would I want to be someone else?) and the ending was so depressing, like "He died sad and lonely because he didn't reach his goals and his name was soon forgotten." (Even though again I had like 48000 deeds!) I was too much like to screencap it. So then I tried again thinking that if I maxed out deeds by at least taking out the rest of Ba Shu individually, I could get a better ending. I beat the odds of time. I ended up with 58000 deeds, over 40 consecutive duel wins, 23 or so battle wins - by 224, and I managed not to die. But . . .Cao Cao did. And Cao Pi became emperor. Because of course it did. Thanks, Cao Pi. If I wanted Yu Jin to die horribly I'd just go read the SGZ. http://imgur.com/a/OKaWz Here's that ending in full (other than they dynasty prospered etc). http://imgur.com/a/hTJ2y And here's the unicorn chaser, the happy ending. Far more fitting for the cow-loving merhorse rider that was Yu Jin in this game! Edit: I get it now. I understand. It turns out that it's the Best Ending (at least for this character type) - the one you get if your relationship is Close with your ruler. If you're a friend or trusted, you become a viceroy. So it was just Ruler, bored and lonely as he was, wanting his vassal with him at all times so he doesn't have to send letters telling him to visit more often. Now he can see his face whenever he wants! Awww. To be fair, basically nobody looks Chinese in the RTK portraits. And yeah Kessen II was just . . . bad. But everyone was bad in that game. That game is so amazingly bad. I haven't played a DW in years but I did see his design and it was shockingly good . . . and normal looking for DW. It took them long enough to get him in there, jeez. But I'm glad. It'll give him fans - people who learn more about him with an inherent bias towards liking him, and I'm all for that, because he was pretty rad. But the fact that he's in DW just makes it harder to understand why they didn't give him a new portrait in XIII. That was a great overview CaTigeReptile! I especially loved that Cao Pi kicked Yu Jin to the curb (how historical!) I love X and still feel it has the most solid RP elements. Now if That game had an event editor, oh by all means I would never put it down! One of these days I should replay X again. You mentioned you didn't care much for battle in X, any specific reason why? I felt of the RP games that X had the most solid combat system. Sure it could have used a few tweaks, but it seemed competently made. CaTigeReptile, I'm so glad you did that playthrough and posted it! In all the years I had played RTKX, I had never come across such an ending that makes me go "wow this is like it's straight out from the book!" I don't know what's worse, living out a lonely life of isolation and shame, or Dying of Emotion right away. Xu Yuan wrote: That was a great overview CaTigeReptile! I especially loved that Cao Pi kicked Yu Jin to the curb (how historical!) I love X and still feel it has the most solid RP elements. Now if That game had an event editor, oh by all means I would never put it down! One of these days I should replay X again. You mentioned you didn't care much for battle in X, any specific reason why? I felt of the RP games that X had the most solid combat system. Sure it could have used a few tweaks, but it seemed competently made. I am glad you enjoyed it - to be fair, I only vaguely remember the battle systems of RTK 7 and 8 so though I do remember enjoying them I would have to play them again. I think what I didn't like about the X battle system is the siege map: every battle, you sit there, all your units crowded against the wall, banging away at the gate, while your opponent waits inside. I do like being able to fight inside cities once you break through, though. Movement is a little clunky, too, and it might be that I like the RTK9/11 battles better, but again I'd have to replay 7 and 8. LW: At least in the fictional scenario everyone knew Yu Jin was treated poorly! I'm sure it's a longshot that anybody reads this, but what programs were people using in their translation projects? In the first scenario, it seems like there should be an event where Cao Cao starts his own force. Does anyone know what are the triggering conditions for this event? It didn't happen for me on two different occasions. Is there anything that I can do to increase my chances of getting an officer transferred to my city? I've been tasked by Cao Cao to conquer Ji province, and I want to get my hands on someone with high intelligence to advise me. Unfortunately, Cao Cao keeps rejecting my request, despite me having a trusted relationship with him. In ROTK VIII, officers with an intelligence of 95 and above give almost perfect advise. Is it the same for this game? I don't know about the very first scenario (184, Yellow Turban Rebellion), but in the second (189, "Dong Zhuo Rises to Power" or something), it's happens relatively quickly and easily. You should make sure that events are on in your options. The longer you play in a particular save, the more likely things will fall apart some and cause events to not occur. 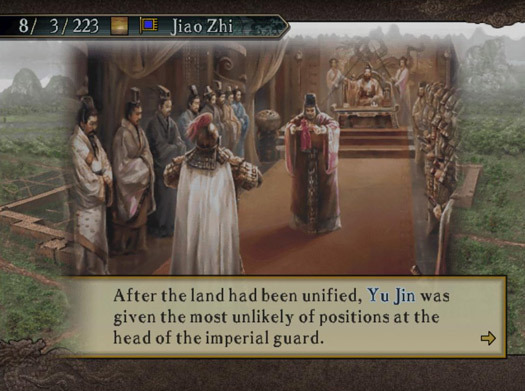 So while getting Cao Cao to form his force and start the coalition is not too hard, and driving Dong Zhuo out of Luo Yang is also relatively easy, but then having events that occur after the coalition become harder and harder as time goes on. So getting Cao to form his own force from 184 would actually be tough. How events occur also depends on your own status. If you're a vassal, you typically need to visit your lord or the castle you serve in. If you're free, you sometimes need to visit your home for events to occur. It varies depending on the event, but your prefect's castle in your home city, your lord's castle, and your house are typically where you can get events to fire once conditions are met. I am not sure. I would maybe just try again after some time passes; not much would be needed, perhaps just a few days. In my experience, AI rulers don't like to reduce the officers available to them personally, even if it makes sense to do so. So if you're requesting someone from his home city, I think he's more likely to say no. Almost perfect, yes. I believe if you manage 110 INT (through a +10 item and 100 INT), your advice will always be perfect. It varies game-by-game, though, so lower might be all right too. At 95 and above, I would always trust my warlord's advice, unless I have a very good reason not to. My bad, I meant the second scenario. I kept waiting for him in Chen Liu, but the event never triggered. I was doing request to kill time though, and it never occurred to me to return home. I guess on my next playthrough, I'll go back home more often. Thank you for your response. Catching wrote: Is there anything that I can do to increase my chances of getting an officer transferred to my city? I've been tasked by Cao Cao to conquer Ji province, and I want to get my hands on someone with high intelligence to advise me. Unfortunately, Cao Cao keeps rejecting my request, despite me having a trusted relationship with him. I've learned after many playthroughs there are some officers the sovereign just won't relinquish. No matter the relationship. Personally, I think the best way to go is just head out and recruit your own while keeping the scrubs he sent busy on city improvements. Once you hit viceroy, it gets much easier. For some reason they seem more likely to add cities to your district then send new officers. You can centralize your officers in a few core cities and return the unwanted cities back to Cao Cao. Another thing that sometimes works(but not reliably) is to send all the officers he sent back to him and request a half dozen or so high end officers at the same time to your city. Sometimes a few will go through as he knows you need help to perform your duties.